Saturday, September 29, 9:30am – 3:30pm, GOURMET MARKET BY XE at Preysal Community Center (Preysal, Couva, Trinidad). “Gourmet and a family themed fair. Face painting and bouncy castle for the kids. Grill/BBQ for lunch plus much more!” Link to event flyer. FREE ENTRY. Sunday, September 30, 10:30am – 4:30pm, THE CRAFTSMAN’S FORUM at Miracle Ministries Pentecostal High School Auditorium (Couva, Trinidad). Foodies can get their fix at The Craftsman’s Forum, which will feature “Fresh Garden Produce, Deserts & Pastries, Ice Cream, Fresh Juices, Home Made Wines, Pepper Sauce and Chutney, [alongside] Leather Craft, Jewellery Craft, Wooden Craft, Scented Candles, Chocolates, Home Made Soaps and Spa Treatments, Clothing,” and much more. Link to event page on Facebook. SPECIAL NOTE: TT Film Festival Film – Nothing Like Chocolate, “a new film about chocolate and the ethics of cocoa production, which features The Grenada Chocolate Company, will be screened at the 2012 Trinidad & Tobago Film Festival.” Lets support our Carribbean partners as we strive to make cocoa king once again!” Thursday, Sept. 20 at 5.30pm, Little Carib Theatre, Q&A; Friday, Sept. 21 at 1.30pm, UWI, Institute of Critical Thinking, Q&A; Friday, Sept. 28 at 5.30pm, MovieTowne Tobago; Sunday, Sept. 30 at 3pm, MovieTowne Tobago. SATURDAY, September 22, 10am-12pm, DEL MANO PESTO SAMPLING at Malabar Farms Gourmet Shop (Maraval, Trinidad)! 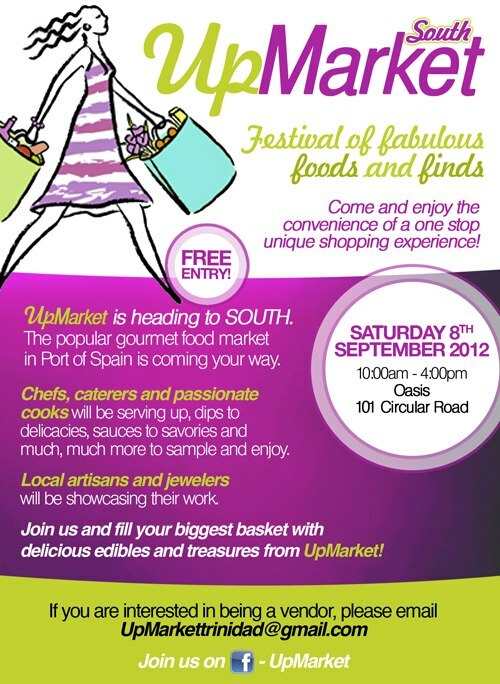 Saturday, September 8, 10am – 4pm, UPMARKET SOUTH at Oasis (101 Circular Road, Mon Repos, San Fernando, Trinidad). UpMarket – Trinidad’s favourite foodie and artisan market – is back in South. Check the UpMarket Facebook page for directions. FREE ENTRY. Sunday, September 2, LE BRUNCH at Jaffa. Trinidad’s most exclusive brunch is at Jaffa this month (September menu link). Catch up with LE BRUNCH on Twitter to possibly score an invite. Saturday, September 1, 9:30am – 3pm, UPMARKET! Woodbrook Youth Facility (Woodbrook, Trinidad). UpMarket is back and kicks off the foodie month with a bang. Walk with your grocery bags and cash for Trinidad’s premier gourmet market featuring local food artisans, caterers, chefs, farmers alongside artists and other artisans selling jewelry, soaps and lotions, art and much more. Tags: Angostura Rum Festival, UpMarket Trinidad. Bookmark the permalink.